KwiKool KWIB2411 Water-Cooled Portable Air Conditioner is a good product. You can read the information of KwiKool KWIB2411 Water-Cooled Portable Air Conditioner, for the deciding on a purchase. The KWIB2411 (nominal 2-ton or 23,500 BTU) is the most powerful 115-volt water-cooled unit in The Iceberg Series, KwiKool’s Flagship Line of portable air conditioners. This unique unit has largest cooling capacity for any portable A/C unit on the market using a 115-volt circuit for both primary and backup air conditioning. With its full-featured design and high sensible cooling, the KWIB2411 is the perfect solution for cooling small server and IDF rooms. Installation for the Iceberg Series is quick and easy with its “plug and play” technology and tops the competition in its small size, big performance and tons of features. From the hi-tech microprocessor controls and self-diagnostics, to the long list of standard features (most of which are not even available in other brands), the Iceberg Series outperforms, outlasts, and out features other portable A/C Units and all at a price that is extremely competitive. All Iceberg Series KWIB water-cooled units require access to a circulating water system, such as chilled water. Using tap water for water-cooled models is not recommended except for temporary applications. Water line sets or other accessories may also be required depending on your application. KWIB models are equipped with a self-regulating internal water regulating valve, which is rated up to 150 PSI. The KWIB2411 runs on a standard 115-volt/20-amp circuit with automatic restart after a power failure. The unit comes with an internal high lift condensate pump and a 5-gallon exterior condensate tank with float activated unit cut-off for short term use. All KwiKool products are proudly MADE IN AMERICA. KwiKool KWIB2411 Water-Cooled Portable Air Conditioner with high quality product, you’ll like KwiKool KWIB2411 Water-Cooled Portable Air Conditioner. 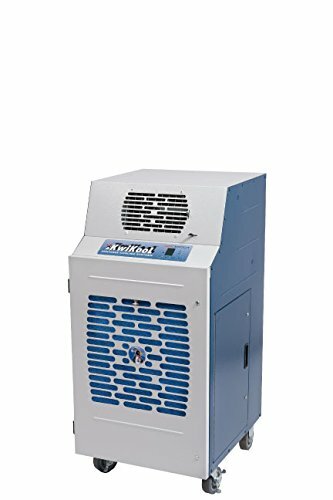 You can read more details of KwiKool KWIB2411 Water-Cooled Portable Air Conditioner at text link below.